If it is a cigar pack from Westfort, it got to be the best. 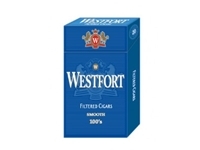 We sell Westfort Light Filtered Cigars with the same trust and in the hard and soft packs. Choose your most preferred flavor and you will be endowed with smooth flavor, distinctive aromas and a rich and fulfilling smoking experience. We deal in the best prices for all popular tobacco and filtered cigar brands. Believe in our best quality and low price guarantee and place your order today. I have purchased this product for sometime now and I have never been disappointed. Good quality product at a great price..OH, did I mention the quick receipt of my shipment? This is a great tasting, mild cigar, but I've smoked the Richwood Milds for over 2 years... and there is no comparison. The filter looks 'Odd' in color contrast to the remaining cigar. Richwood Milds looks uniform. The Westfort Milds go out continuously, which is a hassle and uses up my lighter rapidly. The box is not as sturdy as Richwood Milds. For the price difference, I don't think it is worth switching. I was a cigarette smoker for many years . Last year I decided to try filtered cigars. After trying several different brands I found that Westfort Light Filtered Cigars were just like my old cigarette brand at a fraction of the cos! Very smooth and no after taste. Will never go back to cigarettes again. Replaced Pall-Mall Lights with Westfort Lights. No compromise in flavor. Longer burn. No after taste. Exceptional price! I have been a customer for one year. Pretty good. A lot better than those easy-breaking soft packs. Good taste too! My wife and I have been smoking these for at least 2 years. They replaced Marlboro full flavor cigarettes. The Westfort Light Filtered Cigars are a pleasure to smoke. Being all tobacco with no paper outside they do tend to go out if left in the ash tray. Which is fine with us since we just relight them and continue smoking. The flavor is good for us and the savings is just outstanding. Delivery is by USPS and usually arrive in just 3 to 4 days from Kentucky to Arizona. We have never had an issue with delivery and a tracking number is supplied so we can track the delivery. We feel really pleased with our choice after trying several different ones. The flavored ones like Chery and Vanilla are also a great buy and we usually throw in a carton with our order just for a nice change.